Welcome to Drive Rite Driving School. Want to learn to drive quickly, safely and cheaply? Need some help getting there? 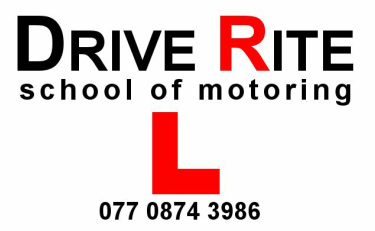 Drive Rite School of Motoring Craigavon is the company for you. For those that are nervous, we are extremely patient and strive at catering for your needs. We are expert driving instructors in Portadown, Lurgan and Craigavon at helping our customers take their independence to the next stage. We look forward to transforming your lives. Great instructor always willing to go the extra mile, no complaints at all. Eamon is a great driving instructor and I would highly recommend him to everyone. He is a patient and pleasant guy and helped me to pass my driving test. Thank you Eamon! Eamon is a really great guy and he is a brilliant instructor. I recommend him if you're a nervous person who lacks confidence when driving, as with a bit of effort you can obtain the confidence through his lessons. Highly recommend never drove a car before getting in touch with Eamon so didn't have much confidence and made loads of mistakes first couple of lessons he is very patient and will soon spot your weak points and iron them out real nice guy if I could give more than 5 stars I would,was also a great help with the theory test questions. I would highly recommend Eamon to anyone thinking of taking lessons, he is an excellent instructor. Very patient and made me fell at ease. Always focusing on areas that need improvement while giving encouragement and praise. Not only did he help me pass first time but he helped me do it with no faults. Thanks again Eamon, I couldnt have done it without you! Such a pleasant man.. would highly recommend to anyone! Just passed my test. Thank you so much Eamon you must have the patience of a saint sticking with me. I will highly recommend you to anybody looking to start driving. I would like to thank Eamon for helping me to get my driving test. He has great patience and I was very relaxed learning with him. Thanks Eamon for all your work. Eamon McParland is definitely one of the, if not the, best driving instructor out there.He is a really great guy he makes you feel at ease when your driving and makes it more fun than it already is. Just want to give a big thank you to Eamon McParland for getting me through my driving test. The first time I have a teacher and helps you to be a confident driver. So anyone wanting to take lessons, I would advise you to go to him, great man. Thank you again. Good instructor did it in the first time!!! Strongly recommended!!! I am so happy that I found him. Eamon is the best instructor ever. He explained every situation and he was patient with me. So everyone should try him. I passed my driving test first time. So happy. A nice lad who could get anyone through the test. Explains everything thoroughly and makes sure you understand. Easy to get on with and a great lad. Eamon is very easy to talk and deal with, explains with deep understanding and knowledge. Perfect all around and a very happy customer here! Highly recommended. "Eamonn was an absolutely fantastic instructor. I had been taking lessons before with two other instructors, cut short of test both time by breaking my leg. Eamonn was by far the best instructor I had and this was proven when I passed first time. Would highly recommend Eamonn to anyone." "Eamon is the perfect driving instructor. Very patient, and really helped me gain confidence behind the wheel. I got my test first time, as well as the theory. Now even a month after passing i find myself hearing Eamon in my passenger seat advising me (even though he isnt there!). I would definitely recommend Drive Rite to friends and family. Thank you Eamon. "Got my test first time with Eamon. Excellent instructor and very patient! really glad i chose Drive-Rite. Many of my friends have passed with them and would recommend them to anyone!"